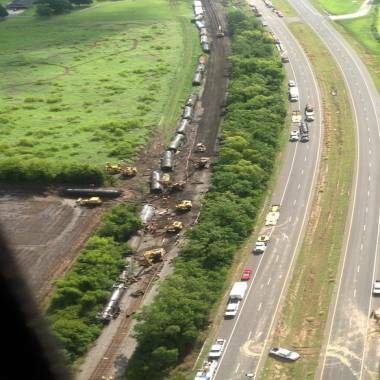 The scene of a train derailment near Lawtell, La. on Monday. The Union Pacific train, which was carrying hazardous materials, derailed Sunday afternoon near Lawtell, forcing the evacuation of about 100 homes. With hundreds of people unable to return to their homes Monday, Louisiana Gov. Bobby Jindal declared a state of emergency as specialists continued to assess the wreckage of a derailed freight train that was leaking chemicals. More than 100 homes were evacuated after the 78-car Union Pacific locomotive came off the tracks about 3:30 p.m. (4:30 p.m. ET) Sunday near Lawtell, about 60 miles west of Baton Rouge. Two of the 27 cars that derailed began leaking chemicals, including the substance sodium hydroxide, which can cause injuries if it touches the skin or even death if it is inhaled. Another car was emitting lube oil, while a fourth containing vinyl chloride was damaged but not leaking. All were secured by 1 a.m. local time, Union Pacific spokesman Mark Davy said. St. Landy Parish President Bill Fontenot added that within an hour of the crash, authorities began evacuating homes near the site. He added that Union Pacific had put up most of the residents in nearby hotels, although some had gone to stay with relatives or friends. "Every carriage has to be checked before people can go back," he said. Fontenot added that rain had hampered attempts to secure the crash site and that authorities had been forced to dig dams to prevent the harmful chemicals from entering the water supply. He also expected U.S. Highway 190, which runs parallel to the track, would be closed for at least two days. "We're working hard with both state and federal hamzat teams to secure the situation," Union Pacific spokesman, Mark Davy said. He said repairs were being made to the 1,600 feet of track damaged by the accident, which he expected to be completed by 8 p.m.
Side booms were being used to right the overturned carriages, most of which would be put back on the track. Those that were too badly damaged, he said, would be removed by road. Jindal authorized state assistance in his emergency declaration Monday. "Any time you have chemicals leaking into the environment, that's a serious issue," he said Sunday night on a visit to St. Landry Parish, KATC-TV reported.